Contact us for more information on how YOU can help our community. There are many ways to volunteer! Just ask us how you can join our team. We greatly appreciate the services our local sponsers! All of our clothing is offered for free and we support families by giving food items. We kindly ask you to donate anything you can. We appreciate all items. We are a 501(c)(3) Non-Profit organization. We depend 100% on our community for donations. It is our goal to help feed the hungry and offer clothing to those in need. We are a non-denominational organization and open our arms and helping hands to all people in need regardless of what their faith is. Remember, what seems of little worth to you might be a treasure to someone else. Of course, if you would like to help out financially we will accept your help. Any donation, small or large, helps us assist another family in need. We also heavily depend on the community's "stuff." We accept donations of all kinds, furniture, clothing, food, kitchen items, anything that YOU don't need anymore. These items we sell at low cost to cover our expenses such as rent as well as utilities. 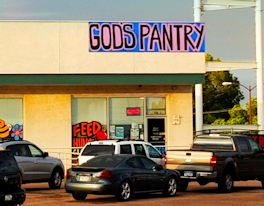 God's Pantry Ministry is located in downtown Fountain, Colorado. We are right across from the Fountain City Hall building. Please bring all Donations around the side of the building where volunteers will be glad to help you. Dont hesitate to call for assistance!